Seen for the first time in public at the AEA’s Tillage-Live 2018 event in September, John Deere’s new ProSeries opener for the 750A All-Till drill will be available from January 2019 and can be retrofitted to existing machines. This replaces the 90 Series opener that has been a feature of the drill since its introduction in the mid-1990s, with global sales of over two million units. The new opener is designed to provide even less soil disturbance, more consistent seeding depth, better seed to soil contact and improved slot closure, and features only one grease point for minimal annual maintenance. In addition for 2019, John Deere will have new, fully ISOBUS compliant software available for both the 750A All-Till and 740A Min-Till drills. A key benefit of the 750A is the extremely low soil disturbance created at the point of drilling, which fits well with cultural methods for controlling grass weeds, particularly blackgrass. 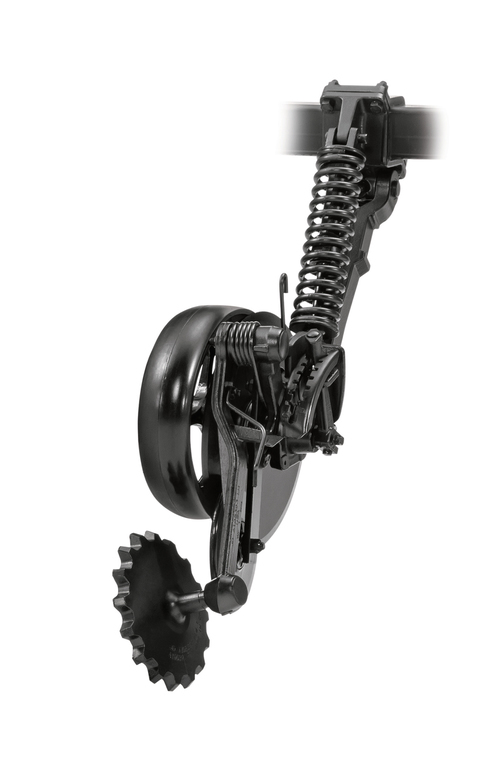 The ProSeries opener further reduces soil movement by utilising a narrower seed boot that fits tighter to the disc, creating less soil throw and providing 40 per cent more consistent seeding depth. Wear life is increased, as the seed boot is hidden more behind the opener disc and subjected to less soil contact. The flexible press wheel is both narrower and larger in diameter, so it fits in the seed trench better, and now features a double-row bearing for twice the service life. This redesign helps to improve seed to soil contact and keeps each seed at a consistent depth, for more even crop emergence and potentially higher yields. Better emergence is also provided by a more aggressive serrated closing wheel, which has improved the closing function by 50 per cent. The seed boot mounting bolt is now replaced by a flag pin which keeps the boot from moving, to increase accuracy and reduce wear. The seed tab, which prevents seeds bouncing out of the trench, has been redesigned to better fit the trench and provides twice the wear life of the previous version. Discs can be changed 45 per cent more quickly to further reduce time spent on maintenance. The new, fully ISOBUS compliant software works with both John Deere and third party displays. As well as managing features such as section control, the software prevents overdosing in tramlines and provides a predosing function. Previously when drilling with tramlines the system simply divided the same amount of seed to fewer openers, which led to slight overdosing in the drilled rows. This latest software reduces the total amount of seed to maintain the correct seed rate across the whole field. In addition, the predosing function prevents gaps in the field when setting off from a standing start. The operator presses a button on the display and the metering system starts immediately, filling the system with seed and preventing any areas being missed.